mediAvatar PowerPoint to Video Converter can convert PowerPoint to video of different SD/HD formats like AVI, H.264/MPEG-4 AVC, MPEG2, WMV, FLV, HD H.264/MPEG-4 AVC, HD MPEG 2 TS, HD WMV with watermark to protect the right of presentation author. You can play the presentations on PC media player, HD multimedia devices and portable players, and even upload them to YouTube now. Remove the animation and sound effect from the presentation. ...... 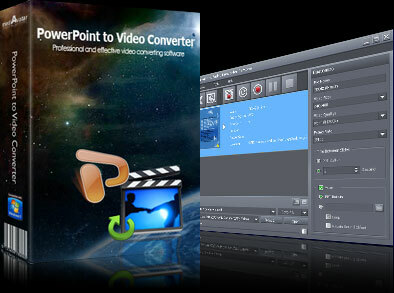 Convert PowerPoint to video of AVI, WMV, MP4, MOV, H.264 and many other formats. 2.Convert PowerPoint to various HD/SD video files for playback on Xbox, PS3, iPod, PSP or other digital devices. 3.Convert ppt to FLV video for uploading to YouTube. 4.Add your company's trademark as watermark to your ppt video for protecting your presentation from spreading maliciously. 5.Rehearse the PowerPoint presentation, add your own commentary and background music, record the rehearsal and convert the recorded presentation to video. 6.Easily convert PowerPoint to video file with all the slide elements retained including animations, transitions, sound effects, actions and slide playback interval. 7.Remove the animation and sound effect from the presentation and convert the PowerPoint presentation to video quickly. 8.Set slide playback interval and add background music you like to the ppt video with original sound effects reserved as well. Qweas is providing links to mediAvatar PowerPoint to Video Converter 1.0.9.1203 as a courtesy, and makes no representations regarding mediAvatar PowerPoint to Video Converter or any other applications or any information related thereto. Any questions, complaints or claims regarding this application mediAvatar PowerPoint to Video Converter 1.0.9.1203 must be directed to the appropriate software vendor. You may click the publisher link of mediAvatar PowerPoint to Video Converter on the top of this page to get more details about the vendor.